ConvertKit (now Seva) recently launched a visual email automation editor. With it, a marketer can build automations and journeys based on the customer’s actions. The new feature allows users to see the full customer journey and add or update the emails in the same view. Be sure to have a look at our review of free and cheap email software to compare, as we recently added Convertkit / Seva it. With the ConvertKit visual automation editor the marketer can create and edit an email sequence and its content without leaving the screen. It is not needed to go out of the automation tool and make updates to each email in separate windows. ConvertKit told us, this is a big deal. And there are no other visual automation editors that update the customer flow like that. Additionally, with the visual automation editor, it is easier to implement tactics like email timers for webinars or to be able to survey the subscriber list inside a funnel. These features were already available in the tool before, but they were more hidden. The first step in the tool is to choose whether a) the subscribers of the marketer should fill in a form, or b) a tag is added to the subscribers. If the marketer chose b), later on, he/she will be able to segment the email audience based on a given tag. Subscribers in that segment can then receive specific emails targeted to them. If the marketer chose the form, then a small window named as “form” will appear in the sequence. To update it, the user needs to click on the window and the ConvertKit content editor will open up. The necessary content changes can be made here like changing the default text or adding an image. The next step in the tool is to add an event, action or condition. These will trigger the (batch of) email(s) sent to the customer. When building automations ConvertKit users can choose from Event, Action or Condition blocks. Content editing an email, form or email series is possible by clicking on the window of that specific step in the sequence and do the update right away. 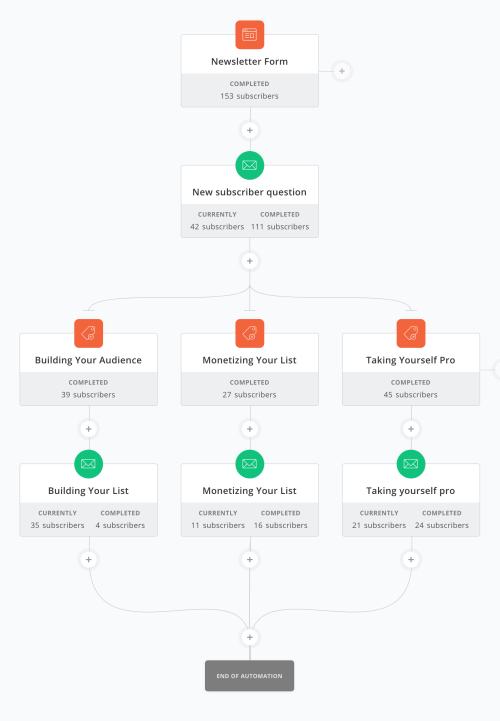 When rules are in place and subscribers are in the funnel, ConvertKit users can see in the tool how many customers have completed which step and how they interacted. In this video ConvertKit shows how automations work, explains the features and walks you through a brief example of how to setup the first automation. Sometimes a marketer doesn’t have to create long customer journeys. For example an email can be triggered if a visitor clicks on a specific link on the website. For such cases ConvertKit can also create single automated triggers with “if this, then that” rules. ConvertKit automation is linking its email sending tool with the user’s blog. Every time a new post is published the tool can send it via email, or schedule a recap email with collection of posts at a specific cadence. It is also possible to target specific segments with these sends. Historically the target users of ConvertKit tool have been bloggers. The most popular uses of the automation editor, according to ConvertKit, are customer journeys for selling a service, launching a product, hosting a webinar, or surveying the audience. On the other hand, bloggers are not the only ones who (can) use ConvertKit. The company’s vision is to support content-driven business owners who write articles, newsletters, and create products and services around them. 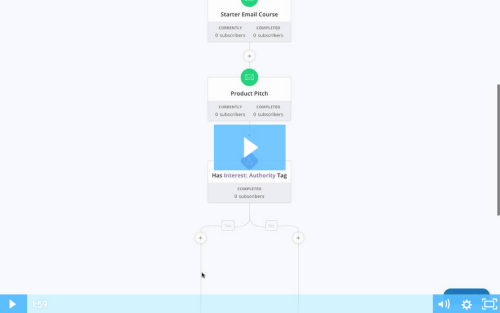 The visual automation editor allows every business owner to have their own email marketing tool that – according to ConvertKit – saves time and gets the core message to the audience the most effective way. ConverKit offers the new visual automation editor as part of its normal packages. No additional fees. The visual automation editor has been developed in-house, in about 7 months. The last few months it’s been in Beta and getting input from around 2000 testers. The company is dedicated to provide the right training for its customers. Their training material is called Tradecraft, which is an online magazine that ConvertKit’s marketing team is writing. It comes out once a month and each issue is on a specific topic that helps to build an online business. ConvertKit also established their product creation masterclass. They helped 14000 bloggers to create a product from start to finish in 30 days. They are planning to do this more over the next years. The company is further determined to support their users via live chat. It has been available for a couple of months, during weekdays and between 8.00-19.00 Pacific time. ConvertKit believes that they should focus on what they can do best and that is Email marketing. If there is another area out there that is useful for their clients, then they rather partner up with the companies that do that well. They recently integrated with Instapage landing page editor, and now Instapage features are available directly in the ConvertKit tool. ConvertKit can be currently integrated with several other tools like e-commerce platforms, lead capture, webinars or course sites. The company told us that it is set out to tie more webshops to their tool and track revenue that came from email through the ConvertKit platform. This way marketers will be able to measure success of an email with further metrics like ROI or revenue per delivered mail. Email marketing has been around for over 20 years and ConvertKit doesn’t want to be seen as reinventing the space. Its features have been “built on the shoulders of giants” like Aweber, MailChimp, Infusionsoft or Active Campaign. They said that they had seen ways that they could build upon what these companies created before. The goal of the new tool is to be more advanced for ConvertKit clients that send millions of emails and to be easier for the beginner of today. Because people who need the most help are those who are just getting started. The visual automation editor allows scaling email marketing programs, therefore, have the potential to maintain their users longer. With the new tool, ConvertKit told us, they are aiming to take on competitors like Infusionsoft or Active Campaign. We will see how ConvertKit succeeds. 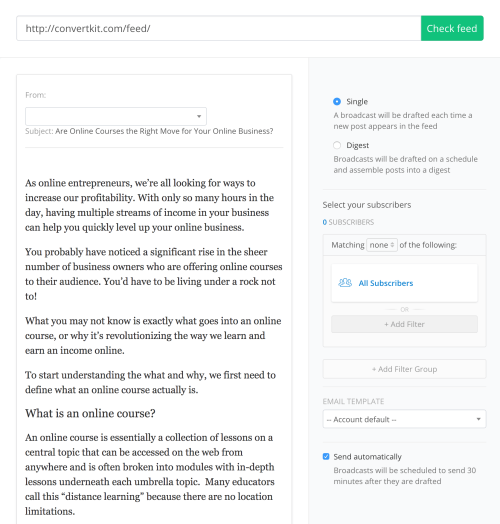 ConvertKit is an email marketing tool specifically for professional bloggers, that features automation and segmentation.